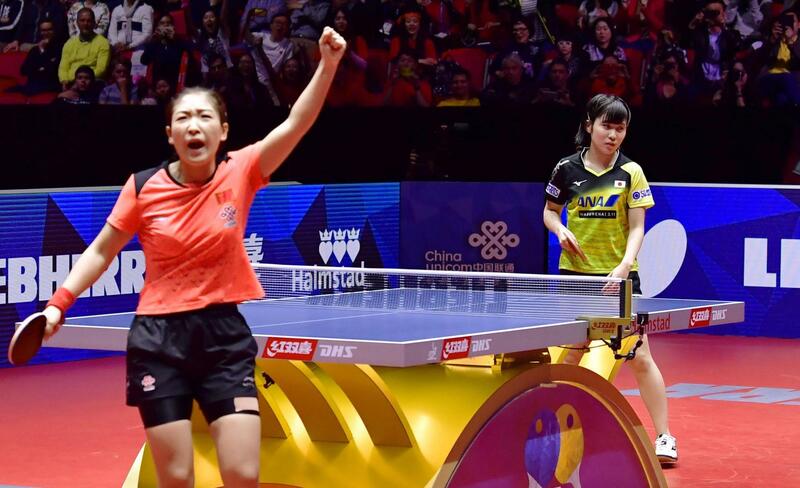 HALMSTAD, SWEDEN - The Japanese team of Mima Ito, Miu Hirano and Kasumi Ishikawa on Saturday was defeated 3-1 by defending champion China, which claimed its fourth consecutive women’s title at the World Team Table Tennis Championships. 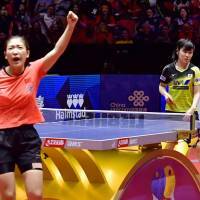 Teenager Ito provided drama in the opening contest at Halmstad Arena with a 3-2 victory over veteran Liu Shiwen, but China’s top-ranked players rallied to win the next three matches — all with a scoreline of 3-0. Hirano lost two matches, the second and the fourth against Ding Ning and Liu, respectively, while Japan captain and world No. 3 Ishikawa was brushed aside by second-ranked Zhu Yuling in the third match. Japan’s team, which also included Hina Hayata and Miyu Nagasaki, was looking to earn its first title in 47 years but had to settle for a third silver in as many tournaments. For China, it was the country’s 21st women’s team title. “It’s a confidence boost that I got a good win over Liu Shiwen for a good start. I focused on playing aggressively till the end,” the 17-year-old Ito said of her contest with the former world No. 1. “I did get just a little bit lucky, but still, it makes all the tough practices worthwhile. I’m going to keep fighting with the desire to beat China,” she said. Hirano, 18, was harder on herself, saying she wasted her teammate’s effort by failing to hold onto the lead. “The tide was in our favor but I lost (the second match) 3-0. My play wasn’t that bad but the more I hit the more returns my opponent made, and I ended on my own mistakes. It’s disappointing,” Hirano said. Meanwhile, Ishikawa said her first experience as captain was a valuable one, but she, like Hirano, was not happy with her performance on the table. “My game was terrible. I wasted Mima’s win. I hope to get my chance for revenge,” she said.